When caring for seniors, their health may take a sudden turn for the worse, and they may suffer a medical emergency in your presence. 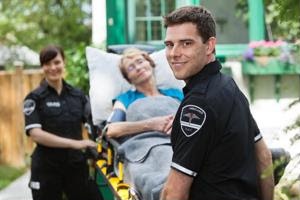 Or, due to issues with balance and mobility, an older adult may fall and sustain serious injuries while you're providing elderly home care services. Have a plan: Having a thought-out method of how to handle these situations will help you keep calm. This can include taking CPR classes, having a stocked first aid kit and creating an easily accessible list of medical providers and emergency numbers. Take charge: With a plan in place, you'll be able to take charge and assess the situation, which can deter any stress that might occur. Look for signs of serious issues, such as symptoms of allergic reactions, consider if a medical condition could be at fault and gather as much information as you can before you calling for emergency backup from 911. Communicate: As paramedics are on their way, it's important to stay calm in order for the patient to stay calm. Continue to communicate with him or her until medical professionals arrive, and be comforting. Have them breathe slowly and deeply and keep them talking as much as they can.